There are some books that you just pick up on a whim. ZOO was one of those books: as it was one that was being given away for free at a convention, I was hardly going to pass it up. But now that I've gotten around to reading it, will it be a case of complaining about things that I didn't have to pay for? Now, as this is a collection of short stories, I will be taking a slightly different approach to my usual one. Instead of discussions of plot and character, I will talk a little bit about each story in the collection. 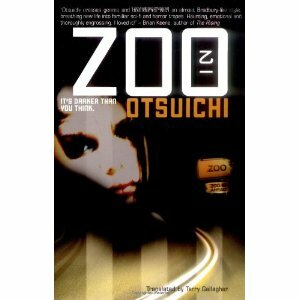 The title story of the collection, 'ZOO', is probably one of the more disappointing stories included. When the story is about a man who receives pictures in the post of his ex-girlfriend's body as it progresses through decomposition, you expect it to really wow you. While it is admittedly creepy, I thought that it could have been paced better, to make better use of the tension created by the situation. 'In a Falling Airplane' is one of the more interesting stories from a more critical viewpoint, as it focuses on the actions of people who have nothing to lose as they are confronted with a life-threatening situation. 'The White House in the Cold Forest' more than delivered the eeriness that 'ZOO' was missing, as it follows a girl who has grown up with almost nothing but abuse as she is unleashed into the world. The narrator's lack of comprehension regarding her own actions is incredibly creepy. 'Find the Blood!' is a mystery story of sorts, as a family try to figure out who could have stabbed their father figure in the back as well as finding the bag of blood that could potentially save his life. I was surprised by the humorous tone that it took, but it was unexpectedly effective. 'In a Park at Twilight, a Long Time Ago' is the shortest of the bunch, and is enjoyably creepy for the two pages or so that it lasts. 'Wardrobe' is another mystery story, revolving around a woman who hides the dead body of her brother-in-law in his wardrobe. This was actually another disappointment, as I didn't feel that the mystery actually worked. While I did enjoy the twists and turns that events took for the majority of it, when the ending came up, I couldn't help but feel cheated as I felt that I had been denied information. 'Song of the Sunny Spot' kinds of feels like it should be in a different collection, as it contains none of the macabre features present in the other stories. That isn't to say that this is a bad story though; on the contrary, I think it's one of the stronger stories, with a genuinely touching relationship between the narrator and the dying old man who built her to look after him. 'Kazari and Yoko' brings the collection back to the nightmarish end of the scale, as it follows the wildly different treatments of the two eponymous sisters. It is a seriously messed up story, with seriously messed up people inhabiting it. I can't help but still feel wary when I look back at it, but then I suppose that is the sign of a good horror story. 'SO-far' is a strange one. Granted, that statement doesn't mean much in light of the rest of the collection, but even compared to the rest of the book, this story is strange. In it, the reader follows a young boy as he has to act as a mouthpiece for his parents when it appears that they can no longer see, hear or perceive each other. If that isn't odd enough, there is a plot twist at the very end of it that I was genuinely not expecting. 'Words of God' is another strange one. This one is more on the unpleasant side though, as a teenage boy goes through life, occasionally influencing things through the power of his voice. I couldn't help but feel really uncomfortable with this one; while unpleasant or morally dubious characters are more common here than I'm used to, this was one of the few characters that made me feel really uncomfortable. 'Seven Rooms', the final story and probably the longest of the collection, is utterly terrifying when you're actually reading it. Considering that it involves a brother and sister as they get caught in a death trap that takes a week to kill you, that's understandable. The problem that I had was that after I had finished reading it, I couldn't help but realise that the killer and his MO are really impractical and would never be able to operate without the police investigating. That might just be me, but if you're going to use horror involving things that are plausible, such as serial killers, then everything needs to be plausible for it to be truly scary. I felt it failed a bit there, but it was really thrilling to read nonetheless. Next review: Rule 34 by Charles Stross.